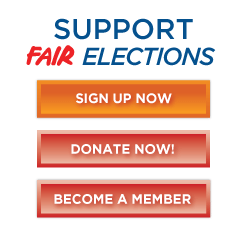 Since the infamous 2010 Citizens United ruling by the U.S. Supreme Court, our elections have been inundated with gobs of secret donations for spending by outside groups on political ads. At the time, Justice Anthony Kennedy believed "prompt disclosure" would be the rule. But Congress hasn't acted. So lawmakers in more than a dozen states, California among them, are proposing legislation to force groups to disclose their donors. They are right to jump in. Californians have experienced firsthand the flood of secret money. Remember the $11 million that the shadowy Americans for Job Security helped funnel into California via Arizona and Virginia in the last three weeks of the 2012 campaign? The donors remain unknown. The law needs to be changed. A number of bills are making their way through the Legislature that would amend the Political Reform Act of 1974. Senate Bill 52, the California Disclose Act, would require all television, radio, print and other ads for ballot measures, independent expenditures and issue advocacy to identify the three largest donors of $10,000 or more for state races and $2,000 for local races. SB 2 would establish a new "stand-by-your-ad" requirement that lets voters know that a candidate "approves" an ad. The bill also would require new quarterly statements of contributions and campaign spending, instead of semi-annual reports. SB 27 would require political groups set up as tax-exempt "social welfare" nonprofits to report a list of their top 10 contributors to the Fair Political Practices Commission and the California secretary of state. In the Assembly, AB 914 would require these nonprofits to disclose the identities of donors who give $10,000 or more. Equally important to disclosure is having an electronic filing system that can provide timely information on who is financing campaigns. The secretary of state's 14-year old, crash-prone Cal-Access system needs replacing. SB 3 would require the secretary of state to complete a new electronic filing system by December 2018. It should come sooner, but legislators are concerned about tight budgets. This package of bills should get out of each house with a two-thirds vote by the end of this month. If there is no easy way to stem the tide of unlimited money in elections, voters and their elected leaders should insist upon greater transparency.